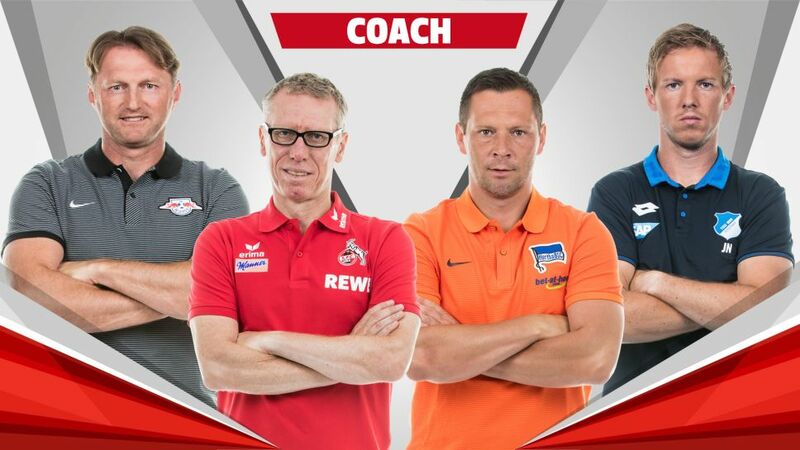 Hasenhüttl, Stöger, Dardai or Nagelsmann (r.-l.): who is your coach of the season so far? It's time to choose your 2016/17 Bundesliga Team of the Hinrunde, so pick out your coach from the quartet below! Despite only arriving in the summer, the Austrian tactician has guided Leipzig to second in the table in the club's first-ever season in the Bundesliga. Signing the Hinrunde off with a 3-0 defeat to FC Bayern München may leave something of a sour taste over the winter, but Hasenhüttl can nevertheless look back on a stunning campaign that has included victories against Borussia Dortmund and Bayer 04 Leverkusen and an astonishing eight-match winning streak. Like last season, Peter Stöger has shaped a Köln side that is extremely difficult to beat. The Billy Goats have lost only three matches so far, conceding fewer goals than all but Eintracht Frankfurt and FC Bayern München (four of the 15 goals they have let in came in one match against TSG 1899 Hoffenheim). At the other end, Anthony Modeste's rich vein of goalscoring form has inspired a derby win at Borussia Mönchengladbach and a 3-1 triumph at FC Schalke 04, not to mention a creditable draw in Munich. Stöger has the team's engine running as sweet as a nut. Hungarian coach Dardai steered Hertha to a seventh-placed finish last term, and his team's positive development has continued this season. Only Leipzig and Bayern have recorded more wins than the Old Lady's nine, and . The club missed out on finishing in the UEFA Champions League places last season, despite spending much of the season in the top four. Hertha fans will hope Dardai can take them one step further this time around. What a year it has been for the youngest head coach in the Bundesliga's history. Nagelsmann took over at Hoffenheim with the team second-bottom in the table. Since guiding them to safety in 2015/16, he has led a young and enterprising team to fifth in the standings at the halfway mark of this season, on the back of a 16-game unbeaten run, taking points off Bayern, Dortmund, Leipzig and Leverkusen. Along with Real Madrid CF, they are the only undefeated side in any of Europe's top five leagues and look well placed to better their highest-ever league finish of seventh (set in 2008/09). Click here to pick your entire XI!